We went to the mall yesterday to buy Crocs for my son…his old ones were two sizes too small (bad mommy). But no shoe shopping trip is complete without me looking at shoes for myself! Usually I can refrain from purchasing a pair, but I NEEDED this pair, I promise. 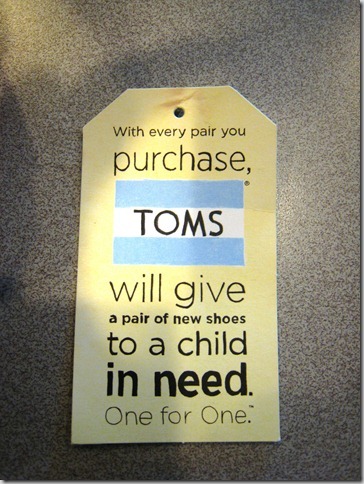 I’ve been reading about TOMS everywhere lately, including our own site. 🙂 So first and foremost, the concept behind the whole company is awesome. But I also heard from a reliable source (that would be my friend who writes a fashion blog) that the new TOM wedges were super comfortable and from the pictures they are super cute. Lucky for me, and for Nordstrom’s bottom line, they had one last black pair in my size. The sales lady said they were on backorder and were selling like hotcakes. Just transform my head into the shape of a sucker, because I bought that, hook, line and sinker. I love this last view because it makes my legs look really long (which they are not)…kind of reminds me of Betty Boop’s legs and feet if she were to take a picture from this angle. Anyway, I’m excited to know that because of my purchase, an underprivileged child will now have a pair of shoes. I love companies who try to make the world a better place. Go out and buy some TOMS today! My e.r.t.h. rating lately is probably a 3 out of 5. I’ve eaten meat-free three days in a row, including some of my favorites from our site: Szechuan Black-Eyed Pea Salad, sprouted beans, Falafels, Spinach & Feta Quiche, and Mushroom, Spinach and Scallion Tart (wow, I’ve been a cooking fool lately!). I’m waiting to see how long it takes for my hubby to notice he hasn’t been fed any meat for dinner lately! 🙂 Shhhh, don’t tell him. Love them Angela! I want to know if my Nordstrom has a pair on sale. I just got my second pair the other day. They are the best shoes. Next post: It’s National Blueberry Month… who knew? ?